Guess the location. It is in Malaysia. This is one of the most notable landmarks. Of course we start with something easy. 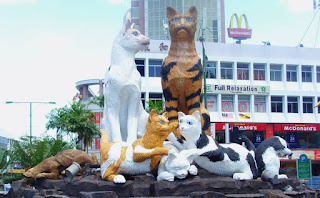 The city has many of these sculptured cats, this must be the one in front of the Holiday Inn Riverside. You're the first one too. Location is ..... in front of McDonald's. The original is taken from http://sallyd.wordpress.com; It's Sally's holiday. Kuching International Airport....23 years ago via KK...but Kuching Town...Nope.